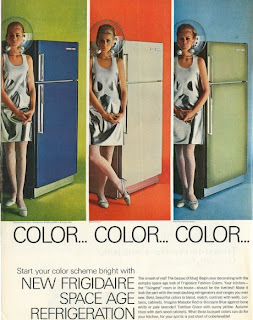 It's Flashback Friday, and look who's come all the way from 1966 to visit KBCULTURE: the Frigidaire Space Ladies. [Don't be alarmed, but they have multiplied since they last descended upon us.] Their silvery, Courreges-inspired dresses set off the Biscayne Blue and the Tahitian Green fridges so well. I wonder what stylish turns their wardrobe would take if they were to pose with today's stainless steel appliances—talk about color, color, color!